Apple has today announced that the iPhone 4 will now be available in Black and white for just $99. The iPhone 3GS in 8GB will be offered free with contract. The announcement was made at the “Let’s Talk iPhone” event held at Apple’s Cupertino headquarters. The iPhone 4 is identical in looks to the iPhone 4 that we know and love in almost every way. It will get the upgrade to Apple’s iOS 5 software, which we have tested extensively and can tell you runs beautifully, even on this ‘older’ hardware. 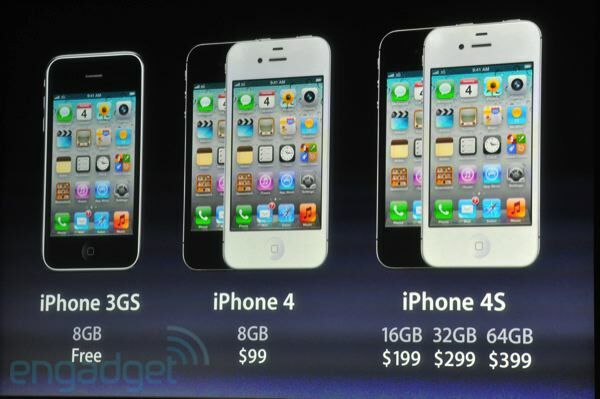 Apple’s higher-end iPhone 4S will be released on October 14th and will be available for pre-order on October 7th. iCloud and iTunes Match will be available alongside iOS 5 on October 12th. iOS 5 is the next major revision to Apple’s software for iPhone, iPod, Apple TV and iPad devices. You can see our complete rundown of the iOS announcements back at WWDC here. We’ve also got a closer look at some of the features of iOS like iMessages, Twitter, Setup and Notification Center, iCloud and alerts. We will continue to bring you the latest news on the features of iOS 5 in our Apple coverage today, so stay tuned here.